The WiDr cell line is used to create the CDX (Cell Line Derived Xenograft) WiDr xenograft mouse model. 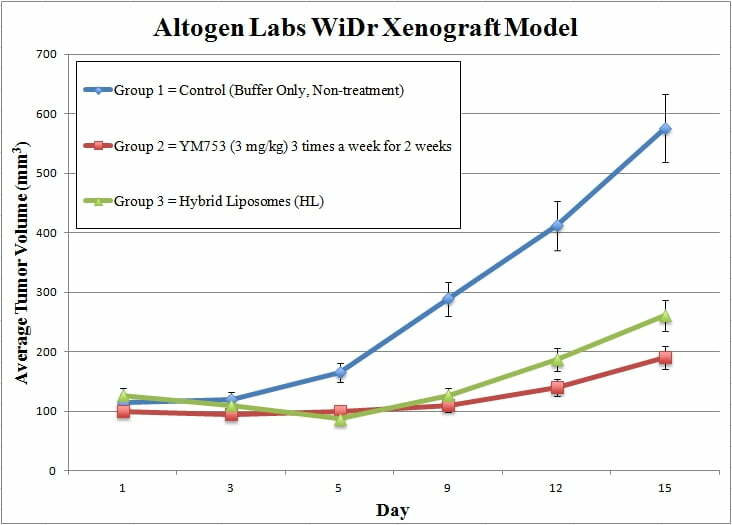 The WiDr xenograft model is known to contain high expression levels of EGFR, thus making it an ideal model to study EGFR-TKIs. The EGFR status of this model is exceptionally beneficial when studying combinatorial effects (e.g. gefitinib, irinotecan). Also, antitumor efficacy has been shown using HDAC inhibitors (e.g. YM753). WiDr cells are collected with trypsin-EDTA. Viable cells are counted using trypan blue exclusion. The mice (athymic BALB/C or NOD/SCID, 10 to 12 weeks) are injected subcutaneously in the flank of a hind leg. One million cells are inoculated into the mice (vol = 100 µL of the Matrigel plus WiDr suspension). The injection are continuously observed until tumors are established. Tumors are measured until they reach an average of 50-150 mm3. Animals are sorted into treatment cohorts and the in-life portion of the study begins. Injections of test material is performed following the dosing schedule. Tumors are continually measured and body weights recorded. At the end of the study necropsies and tissue collections are followed according to the study design. Tumors are excised and weighed. All tissues collected can be placed in RNAlater, snap frozen or added to 10% NBF for histology.